Look after your lawn with Wilko! This spring be the envy of your neighbours with a lush lawn to admire. 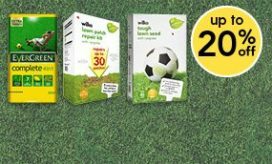 Right now get up to 20% off lawncare products at Wilko.